Welcome to our December Rick St. Dennis MFA (RSD) Showcase. 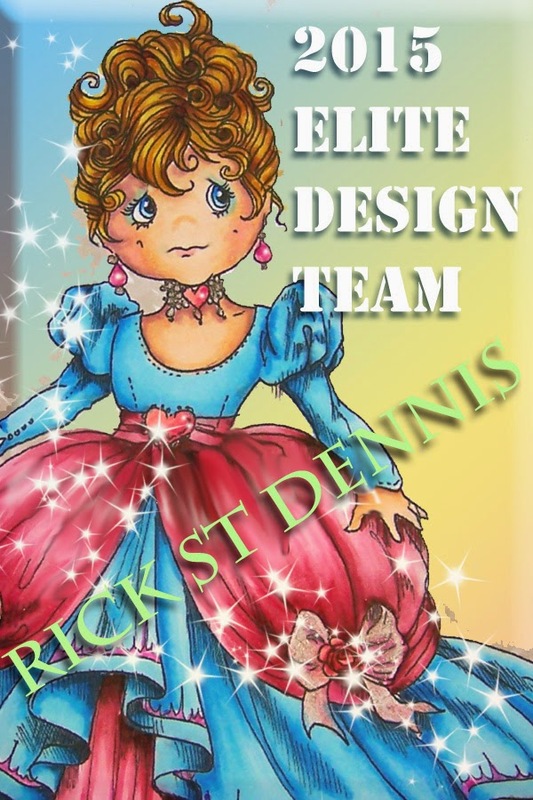 Some, and sometimes all, of Rick’s Elite Design Team (EDT will be showcasing projects completed with some of Rick’s amazing digital images. Rick will be giving us a monthly theme and we will be picking our own images from his vast collection of images in his Etsy and Zibbet shops. Rick’s choice of a theme for us was Valentine. For my RSD’s Showcase piece I decided I wanted to create a whimsical tag to go along with my whimsical image. 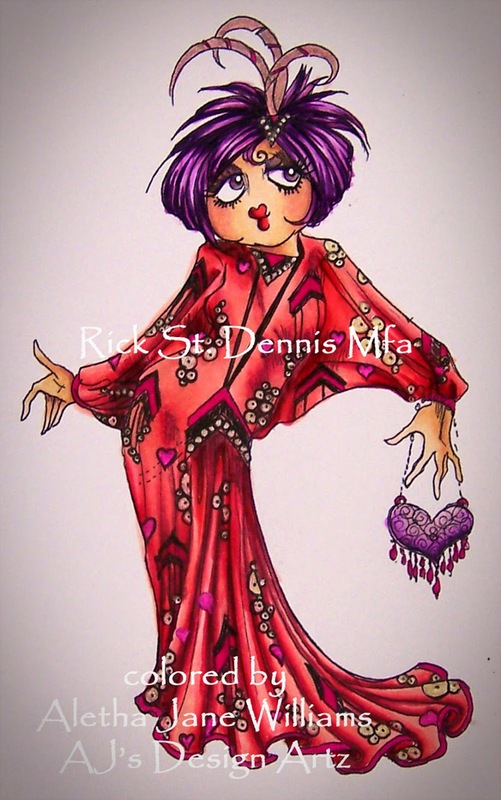 My whimsical image is titled “Helen Hartz Valentine Girl,” and I feel like I can say she is truly a whimsical Valentine’s image. Helen Hartz can be found in Rick’s Etsy and Zibbet shops. As you all know, I start with my Copic coloring before I do anything else. After the coloring is complete, then I usually pick my designer papers. For my tag project, I knew I wanted purple and red to be the color combo, as dictated by my colored image. I found the perfect paper in my Fun Stampers Journey stash. My tag size is 4”x 8”. This is the perfect size for adding all the fun embellishments. I used some Really Reasonable Ribbon to hide the seam of the two papers and it added a little more light to the project. I hope that you get some joy out of my fun tag. My stash: heart punch, baubles on hearts, PITT black fine point pen. At our Sparkle & Glitter blog we are having a “Progressive Challenge.” Click here for more information. There’s still time to join. You can pick up the image, “Christmas Party Hat,” in Rick’s shop to join in. There will be a new progressive challenge starting Jan. 1, 2015. The theme is anything goes, and if you join this first part of the challenge, then you will receive the new image FREE to join the second part of the progressive challenge. Every week on Rick’s blog there is a “Pick of the Week” contest. 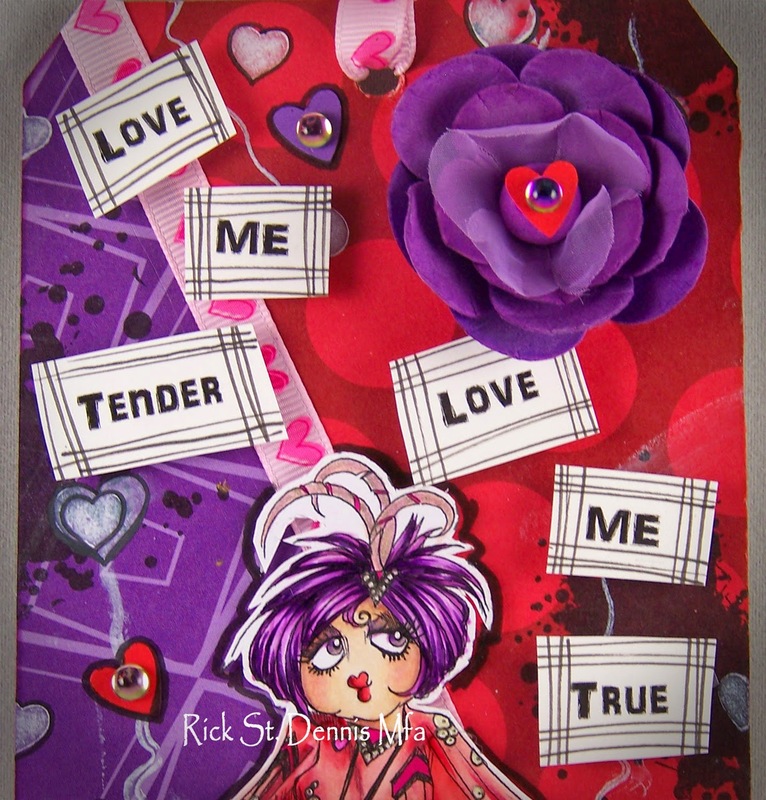 Rick’s EDT picks out fantastic projects that use Rick’s images. After those are chosen, you, the fans, get the final vote. This is a lot of fun and there are wonderful prizes too. If you have used an RSD image in a project, come strut your stuff at our Facebook group and your’s may be picked. Jan. 5, 2015 will be the next RSD Facebook group Art Contest. These contests run for two weeks. Random.org chooses the winner and the prize is one digital image from Rick’s Zibbet store. Thanks for stopping by. If you have any questions, please contact me. I want to wish you, my fans and readers, and the entire world a very Merry Christmas, the Happiest of Holidays, and a fantastic, prosperous, and Happy New Year! Love, love this tag! She's fabulous and you've coloured her beautifully. The pink heart ribbon is just perfect and I adore all the little hearts. Reminds me of the poem Warning by Jenny Joseph about being old and wearing purple and red!! This is uber cool! Great job on the coloring, love all of your highlights. And really love how you colored her hair. Amazing looking tag!